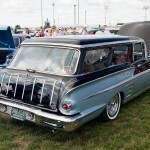 No, this is not an ultra rare ’58 2-door Nomad wagon that you’ve never seen before. Chevrolet never made such an beast in ’58. This is a custom or “phantom” vehicle created by the late Washington State resident Jim Corbett. 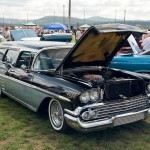 It is based on a 2-door Yeoman model, the only 2-door wagon made by Chevrolet in 1958. It has been outfitted with Impala side trim and Nomad tailgate trim and emblems. 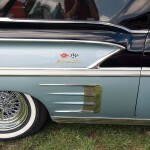 The B-pillar treatment is custom made to mimic the look of the ’55-’57 Nomad.